Often before teams learn to be more effective, it is important to cultivate the team members’ self-awareness of their team culture and their impact on each other and the entire organization. Help teams achieve self-awareness and establish current benchmarks with personality and leadership assessments designed especially for teams. The Leadership Culture Survey identifies the gap between a team’s current culture and its desired one. It also measures how the leadership culture within your organization and/or team compares to that of other organizations. TLCS focuses leadership development efforts and creates a very compelling rational for change. By connecting a well-researched battery of competencies with the underlying motivations and habits of thought, revealing the relationship between patterns of action and the internal assumptions that drive behavior, TLCS helps teams go to the source of behavior to get greater leverage on change and to advance the coaching conversation. The Leadership Cultural Survey was developed and are owned by The Leadership Circle™. Marie Peeler and certain associates are certified by The Leadership Circle. Leadership teams face an unprecedented demand for cross-functional collaboration and faster decision-making. Communication being at the core of a leadership team’s productivity, the Team Conversational Norms Diagnostic™ is designed to help teams self-diagnose the efficacy of their conversational habits in six dimensions. 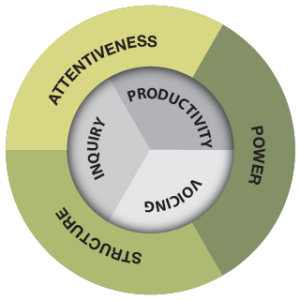 By organizing and presenting team data for the core dimensions of Voicing, Inquiry and Productivity, and the Influencing Dimensions of Power, Structure, and Attentiveness, this unique diagnostic tool allows teams to reflect on their conversational habits and patterns as a first step to identifying improvements. Peeler Associates is pleased to add the Team Conversational Norms Diagnostic™ developed by The Right Conversation as the newest tool in our suite of assessments. Start cultivating more collaboration and greater leadership effectiveness on your team today by contacting us to learn more about team coaching, team assessments, facilitation, and business retreats.